Mary Dyer was hanged in Boston on this date in 1660 — the most famous of that city’s four “Quaker martyrs”. Monument in Boston to Mary Dyer as “witness for religious freedom”. (cc) image by Andrea Schwartz. By the time of her last ordeal, Dyer already had a quarter century-old reputation for religious misbehavior in the New World. She brought with her a proclivity for the heretical: in Massachusetts, where the Puritan majority delivered the persecuting, Mary quickly fell foul of right-thinking folk by backing Anne Hutchinson in a theological controversy. * When Hutchinson was convicted by a church trial and banished, Mary Dyer cinematically walked hand-in-hand with her out of church. On top of everything else, she was known to have stillborne a deformed monstrosity (“a woman, a fish, a bird, & a beast all woven together”) which was the kind of thing these people understood as deadly serious. Mary and her husband went to exile with Hutchinson, and were among the first English settlers of Rhode Island, before returning to spend most of the 1650s back in England. 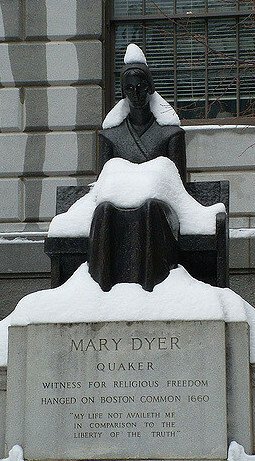 There, Mary Dyer converted to one of the new entrants to the Commonwealth’s welter of novel sects, Quakerism. This new faith’s emphasis on egalitarian personal religious experience ungoverned by ordained clergymen met an instant ban once Massachusetts caught wind of it, with a statute imposing mutilated tongues and trips to the pillory for expounding the outlaw doctrine. To these would be added the threat of the gallows for repeat offenders with the temerity to return from banishment … and Mary Dyer is only the most famous of four Quakers who actually suffered this penalty. The Heart of N-England Rent at the Blasphemies of the Present Generation: Boston Rev. John Norton‘s 1659 anti-Quaker tract advocates their execution. Dyer’s defiance of the law was straightforward, keeping with the bold tradition of martyrdom in witness. Jailed in Boston in 1657, her husband (who had not yet followed his wife’s conversion) managed to arrange her release; she returned in 1659 to visit other imprisoned Quakers and they were all banished for their trouble. Shortly after, she returned to Boston with William Robinson and Marmaduke Stevenson: these were the first two Quakers put to death by the Puritans, but Mary Dyer was spared at the foot of the gallows and again expelled, finding temporary refuge in Rhode Island. Edward Burrough’s A Declaration of the Sad and Great Persecution and Martyrdom of the People of God, called Quakers, in New-England, for the Worshipping of God, which also catalogues the many brutal punishments inflicted on Quakers up until 1661, preserves an account of Mary’s final return to Boston in May 1660 and her immediate arrest for same: it was enough for her to acknowledge her identity to reinstate her former sentence. The very next day, she was drummed — to prevent her preaching — on a mile-long walk a gallows on Boston Common. This time there was no reprieve waiting: only immortality. * This controversy drove the short-term governor Henry Vane back to England, and martyrdom during the interregnum.